Day 20: Etosha Camps to Twyfelfontein - This has been our finest driving day so far... that's the universal verdict from all those propping up the mahogany bar at the top of the large thatched and beamed lodge nestling in the landscape of the red cliffs of Twyfelfontein. 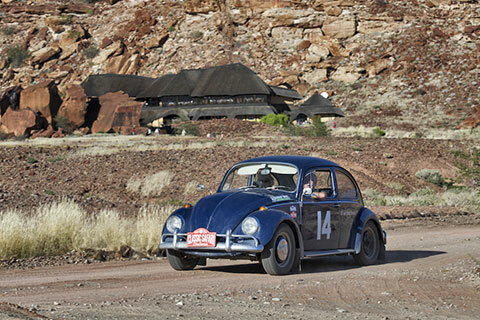 The Classic Safari has visited this lodge during a previous event, and our drive from Anderson's Lodge (a wildlife Safari camp that also featured in previous routes) took us across country down some truly spectacular driving roads. We have had some great gravel drives up to now but nothing quite as spectacular as this. Firstly, the tracks had all been freshly graded and, apart from the odd wash-away, they were virtually pot-hole free. We hammered down fast flowing open roads leaving long rooster-tails of spiralling dust that hung in the still air of the early-morning light. It was over two hours before we saw another car - a farmer's pick-up truck, and the entire morning just bore on and on like this - fantastic open-road motoring. Where else this side of Mongolia can you drive for hours like this? Naturally, on tracks this good we had to stage a couple of Medal Sections. Results on the first saw a narrow win for the Porsche 911 of Peter Lovett, disappointing his keen rivals with Ford V8 engines. Second was the Mustang of Mike and Eunice McInerny, and third the Ford Falcon of Dennis Varni. 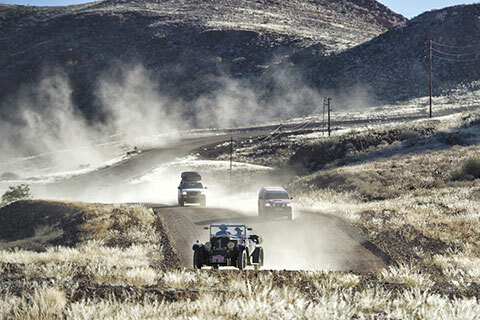 Bill Cleyndert's 1800 was seconds behind, just ahead of the Lancia Fulvia. The Volvo of the de Souzas was sixth and the XK Jaguar of Philip and Yvonne Haslam seventh, who won the first of today's Gold Medals. On the second Test of the day, the McInerny Mustang beat the Varni Falcon while Jose de Sousa pulled out all the stops in the well-campaigned Volvo 144 to take third. The Lovett Porsche settled for fourth, having found the marbles in the quartz gravel particularly slippery. The Cleyndert BMC 1800 ended seconds behind in fifth place. Greg and Liz Newton collected Gold Medals finishing seventh in their three-litre Opel Commodore. Our film unit caught the crews' reactions at the end of all this, with Bill Cleyndert grinning from ear to ear once more saying it was "all fantastic" but again bemoaning the lack of power in his 1800, which has not disgraced itself as it’s the first Landcrab to beat a Porsche 911 since 1968. As for the Porsche, Peter Lovett's words behind his sunglasses were simply... "Today is rather like driving on ice”. Dennis Varni was also keen to express a desire to beat the Porsche, adding: “It's the only thing that matters in life right now”. His growling Ford Falcon however is being given a tough time by the surprisingly consistent effort from the Mustang crew. We arrived at the well camouflaged lodge with its big thatched roof blending into the shadows of the large round boulders of the cliff face just as the sun was going down, the red rocks responding to the sunset with a rich orange glow. It has not been an easy day for some, with several members of the Organisation nursing punctures - once again the sweeper mechanics are unlikely to be attending tonight's dinner, with the Crossley having made it in tonight, but again seeking attention of Tony Jones, Andy Inskip and Rob Kitchen, with medic Mark Van Rennsburg also getting his hands oily. They would be working long into the night. Meanwhile in the restaurant, Maria de Sousa took to the dance floor and others joined in with a round of singing initiated by the kitchen staff. It has been a long day - followed for some by what looks like a long night. Day 21: Twyfelfontein to Swakopmund - A late start to the morning for a change, with an easy day ahead meant there was time to take in a rocky walk to inspect the remains of some ancient cave paintings. Reputed to be thousands of years old, first discovered by a German sheep farmer in 1921, this is now a World Heritage site. Zebra, a lion, and antelopes have been etched into the faces of several large rocks - visiting this spot isn't easy, you are soon clambering over large boulders, all rather like the lower reaches of Mount Snowdon. With that out of the way, we got back to the driving. Today's route took in the fringes of the great Namibian Desert, the oldest desert in the world, before turning South to run down a 50km section of the Skelton Coast, past the wrecks of several rusting hulks. As yesterday though, with roads as good as this, we also ran a Medal section through a dry and dusty valley before the lunch halt in Uis where most of the crews took advantage of the relaxed timing for the rest of the day to enjoy an alfresco lunch. We arrived at the night halt, the Swakopmund Hotel, a converted railway station and yet another 'eccentric' lodging for the Rally. First built for steam locomotives in 1901, the two platforms now form the two wings of the hotel. Where railway lines once divided the two halves of the station, there is now a swimming pool. It has been a hot day but the evening air down here on the coast is decidedly cool and nobody has yet gone to get their swimming costume. Out in the car park the sweeper mechanics are busy as usual, with one team yet to arrive as they shepherd in the Haslam's Jaguar with fuel problems. The Crossley's adventures also continue. This time it's sounding serious with rumours circulating that the 1928 Vintageant is suffering from gearbox failure. Another long night for the support team sounds inevitable.